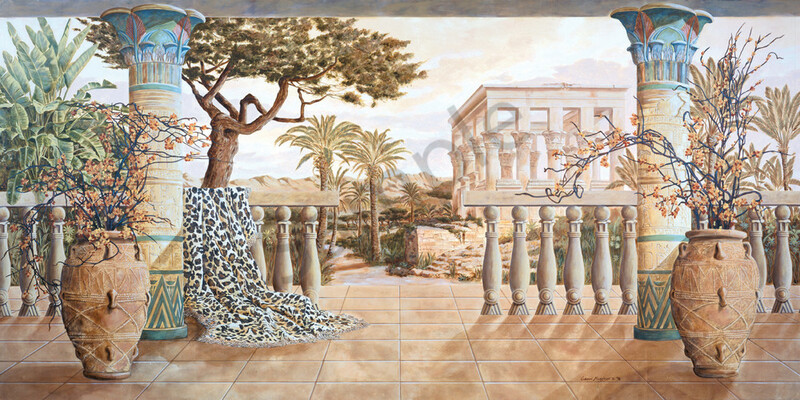 Garden of Luxor was originally 120" X 48" acrylic mural on canvas. It is now only available as a print now at the sizes shown here. (Select "Wall Preview" below for a room type, size and wall color to better view the art). Garden of Luxor was originally done as an acrylic mural, to be hung high in a niche. It is only available as a print now at the sizes shown here. I have always loved history, especially Egyptian history, with it's rich symbolic tapestry of heiroglyphics and architectural wonders. It was a real pleasure to have a client who wanted that, and I could indulge my artistic whims on the subject. The depth and wonder of a place that could sustain a fruitful belief system for over 4000 years was what I was going for here. (Select "Wall Preview" below for a room type, size and wall color to better view the art).